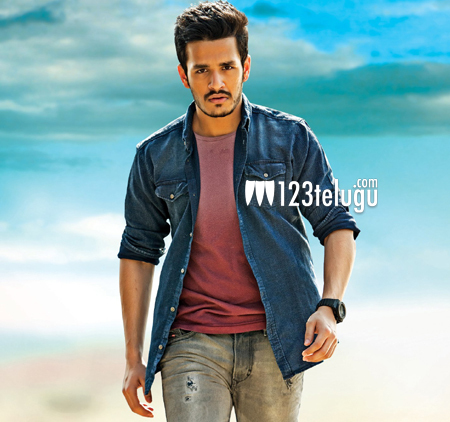 Akhil, the latest entrant from the Akkineni family, is currently busy shooting for his debut film in VV.Vinayak’s direction. The shooting is on the verge of its completion and the makers are planning to release this film in October. The title of this film is yet to be announced. Earlier, we have reported that the movie is doing superb pre-release business in Nizam and Ceded regions. Now, as per the latest reports, the movie fetched a stunning price in Andhra as well. It is heard that a leading distribution company grabbed the Andhra rights for a whopping price of 18 Crores. Sayesha Saigal is playing Akhil’s love interest in this film. Anoop Rubens and SS Thaman are composing tunes and Nithiin is producing this film.